Located at a few steps from the beach and not far from all major Rimini Riviera theme parks, this children-friendly hotel in Cattolica offers many facilities in a modern and elegant yet cozy atmosphere. Form the hotel to the beach equipment, everything has been designed for families. Comfortable spacious bedrooms with a sea view, a bar that is open day and night and provides a great opportunity for socializing or simply resting after a full sunny day on the beach, a TV room, with a film library and board games, free bicycle use and an Internet point. Our restaurant is the main focus and our pride and joy. We will delight you with our typical local cuisine, which is well appreciated and famous all over Italy. In our hotel with swimming-pool Cattolica, guests can be sure to relax and sunbathe at will, thanks to a superb pool with hydro-massage and anti-stress water cascade. On the beach, you will find many activities for all ages, sports, gym, dances, and a wellness-centre. Our youngest guests can join in sports tournaments, team games, creative workshops, all under the supervision of our expert staff. 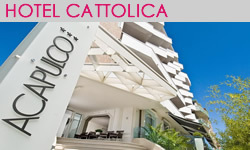 No doubt, some of the best holiday deals in Cattolica can be found here.